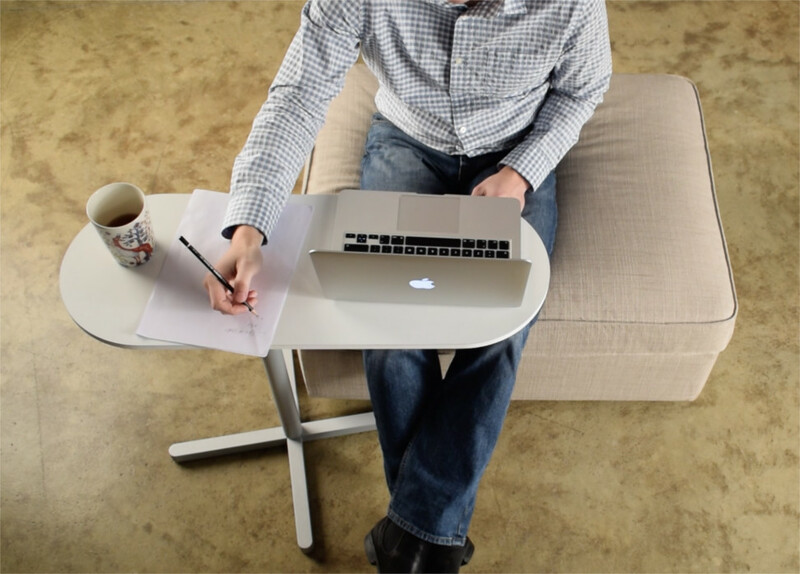 Swiveling table top can make life very comfortable. You can turn the desk away from you when leaving the seat, and it is convenient in finding the best position for yourself and the desk. Sitedesk is designed just for that. Moreover it is possible to adjust the height, and you can easily move the desk to where you are. Internet is full of lightweight adjustable laptop tables. They might seem to be highly functional, but the main problem is they are light in weight and unstable. The wheels makes the table roll away from you when you rest your hand on it. The desk base don’t fit underneath sofa. And the desk does not really swivel. You need to move the table using its wheels, but they don’t work necessarily. wheels don’t roll as meant. Table rolls away when rest your hand on it. They do’t look good either, they look technical. Simple laptop table is another option. They look better design-wise, but they don’t give you the functionality. They don’t swivel and are not adjustable. The selection can be big, but the table tops tend to be small in size. It is uncomfortable for your body to lean yourself towards the desk. 1. It keeps the computer away from human body for good. 2. It is a stable surface which holds laptop, allows to take notes and has room for other bare essentials. 3. It is stable, adjustable, movable and convenient. 4. It allows a person to have a healthy and comfortable posture, and provide easy access to the laptop. 5. It allows to bring the table top over the sofa and bed. 6. It looks like a piece furniture that people would like to have in their room.